Since now is a busy time in the academic job application submitting/interviewing/offer making cycle I thought it would be worthwhile to provide a compilation of job search and interview tips that I have collected and written about on this blog over the years. And, later this month, I will be marking 9 years of blogging, which is a big milestone! I have chaired 20 doctoral dissertations and placed all students well, and, most importantly, almost unanimously they have all thrived and are very successful in their chosen careers. Plus, I have chaired multiple search committees, and served on others, so I do have a lot of experience on this topic. Sometimes, honestly, I wish we could have hired all those candidates that we interviewed! This year I believe is one with a very dynamic job market for those seeking academic positions in operations research / management science / operations management (and related disciplines), so it is an especially exciting time. Below is information on specific job-related blogposts that I have written over the past few years with additional tips and even presentations posted in each. In the blogpost: Faculty Job Candidates need to be Resilient - Some Helpful Tips I emphasize that: One has to be energetic, positive, and enthusiastic because the department is looking for a colleague and you are also being evaluated on how good of a fit you will be in terms of research, teaching, service, and collegiality! I believe that this advice has stood the test of time and is extremely relevant. The blogpost also contains a link to an excellent presentation that one of my former doctoral students, Dr. Jose M. Cruz, entitled: "The Myths and Facts of How to Get a Tenure Track Academic Job and How to Get Tenure" . Dr. Cruz is now a tenured Associate Professor at the School of Business at the University of Connecticut. 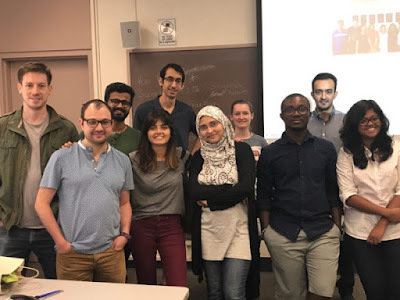 In the blogpost: Tips on How to Get an Academic Job at a Business or Engineering School, which was based on a UMass Amherst INFORMS Student Chapter panel, The Process of Apply for and Securing and Academic Job, I summarized the highlights of the discussions. I also included a link to the presentation given by my former doctoral student, Dr. Amir H. Masoumi, now an Assistant Professor at Manhattan College. Another blogpost with lots of great advice was also based on a panel at the Isenberg School of Management: Getting that Dream Academic Job - What We Learned from Isenberg School Panelists. And, in the blogpost (one of my most accessed ones): How to Ace the Second and the First Interview for an Academic Faculty Position, I include some useful links from The Chronicle of Higher Education. Searching for an academic job, applying, interviewing, and then waiting for the outcome, plus deliberating and negotiating to secure the best possible offer, all take time, but the destination makes this journey very worthwhile. Best of luck in your job search! What I Am Very Much Looking Forward to in 2018! We are in the New Year and the frigid temperatures in the Northeast USA with a pending major snowstorm make this a good time to reflect on what to look forward to in 2018. There is much on the horizon to be excited about and thinking of all of these forthcoming events and projects is warming me today! I just signed off on a contract with Springer to produce another edited volume on Dynamics of Disasters, which I am co-editing with my great colleagues, Professor Ilias S. Kotsireas of Wilfrid Laurier University and Professor Panos M. Pardalos of the University of Florida. This volume is a followup to our conference in Kalamata, Greece last summer and already we have some terrific contributions, all of which will be refereed. We had previously published a Springer volume in 2016 based on our conference in 2015 but, given the number of disasters, as well as the associated challenges for both researchers and practitioners, another volume is clearly warranted. Plus, working on this volume is very synergistic with the course: Humanitarian Logistics and Healthcare that I will, again, be teaching this spring at the Isenberg School and am very excited about. This will be a very busy, event-packed semester. As part of the UMass Amherst INFORMS Speaker Series we will be hosting Professor Hari Balasubramanian of the Department of Mechanical and Industrial Engineering at UMass Amherst on February 9. Professor Balasubramanian is an expert on healthcare and we are very much looking forward to having him kickoff our "spring" semester Speaker Series. Then, on February 23, 2017, I am thrilled that Professor Jim Orlin of the Sloan School at MIT will be the guest speaker. Professor Orlin is renowned for his work on networks and is an INFORMS Fellow and I (and the students) are delighted that he will be coming to Isenberg! On March 23, 2017, we will welcome Dr. Les Servi of Mitre Corp, who will be speaking in our series. Dr. Servi is an INFORMS Fellow and one of the most active INFORMS members that I know. We are eagerly awaiting his visit and presentation. We are also finalizing a speaking date for Dr. Davit Khachatryan, an Isenberg PhD alum in Management Science, who has worked at PWC and is now at Babson College. The UMass Amherst INFORMS Student Chapter started a fabulous initiative last semester of interviewing our speakers and posting the interviews on youtube. We hope to continue this new tradition this semester. Given that I am the Faculty Advisor of the wonderful UMass Amherst INFORMS Student Chapter I try to be present at all the speakers' talks and host the lunches as well. This always requires some juggling but as operations researchers we tend to be experts at scheduling. Below is a photo of this year's Chapter Officers and several members. 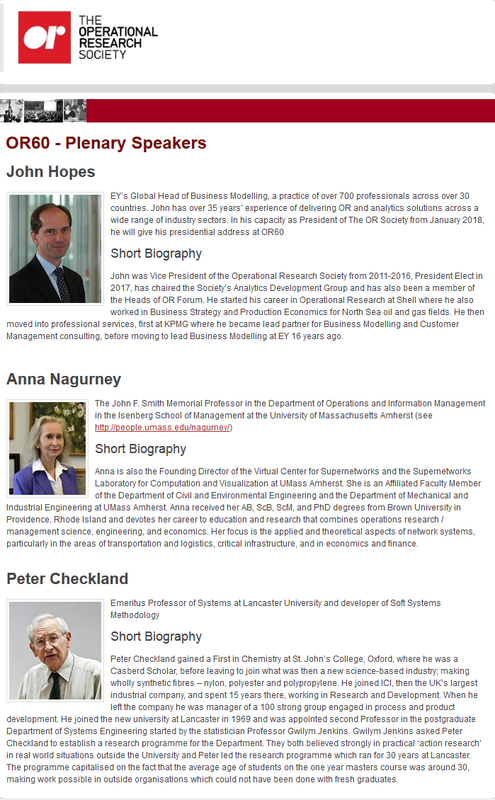 On February 16, 2018, I will be speaking at the Foisie School of Business at WPI, and was invited by my former doctoral student, Dr. Sara Saberi, who is now a professor there. She has terrific colleagues and I am looking forward to speaking there very much. On February 24, 2018, the Isenberg Women in Business Conference will take place, always one of my favorite Isenberg events, which has become an annual tradition. The speakers, panelists, discussions plus lunch and snacks are all amazing! And, on March 8-9, 2018, I will be a keynote speaker at the Vinepa conference in Italy and will speak on cybercrime and cybersecurity. That will begin my "spring break" which will also include giving lectures at Lancaster University in England! On April 6, 2018, I will be at the University of Wisconsin Madison to speak in the colloquium series at the Department of Industrial and Systems Engineering. What a marvelous group of speakers this department has lined up and I am deeply honored to be part of their series. I may have one or two conferences in April - still undecided as to whether I will be going or will have doctoral students go. In early May, it will be that joyful time of year in which we see our students obtain their degrees at the Isenberg School and UMass Amherst graduation ceremonies - a true highlight of academic and personal achievements as well as a very celebratory time for all concerned. And, on May 16-18, 2018, I will be giving a keynote at the Swiss Transport Research Conference in idyllic Monte Verità, Ascona, Switzerland. The conference organizers are flying me business class and providing accommodations for a week, which is humbling, to say the least. The summer will be busy with other opportunities, conferences, and, of course, a lot of research and mentoring of students, and, come Fall, the wonderful academic cycle will begin anew. September 11-13, 2018, OR60 is taking place at Lancaster University in England and I will be one of three plenary speakers.